Have you been in the market searching for a new recurve bow? Whether you’re looking for one because you’re interested in the sport or if you’re using it for hunting, you’ll need to know precisely what features will work for you and your body. First, you need to determine your draw weight requirements. This is the weight that you need to apply before you can fully draw the bow. You would also need to decide whether you will use the bow for recreational purposes or hunting since both of these bows have different features. Lastly, you’ll need to compare recurve bows on the market and find one that is suited for you. To help make the process of selection easier for you, we’ve decided to review a recurve bow kit. This kit comes with one black bow and two types of arrows as well as other useful accessories. Below are the specific features of the bow and the pros and cons of the whole product. The D&Q Bow is strong and sturdy as is made from high-quality materials. It comes in a stylish black color and doesn’t weigh too much and isn’t too light, giving you the perfect balance when you use it. The grip is ergonomically crafted to feel soft on your hands while also providing you with superior grip. For clean draws, there is a well-crafted ledge which makes it easy for beginners or experts to use. In addition, there are multiple draw weights to choose from, specifically 30, 35, 40, 45, 50, 55, and 60 pounds. This recurve bow shoots longer distances than other bows and uses less of your strength. This allows you to enjoy your time using the bow instead of feeling tired and fatigued. The D&Q Recurve Bow is great for hunting small and mid-size game animals as well as during target practices and archery tournaments. As a guide, for a right-handed bow, you would use your right hand to draw the string and the arrow while your left-hand holds the recurve bow where the arrow rests. This allows you to draw back the string with power and gives you a perfect and steady shot. When you use this bow, you’ll have multiple options for limb weights which offer you the ability to switch between pullback weights. You can choose to adjust it to make it easier or harder for you to use, making it suitable for an arm and upper body workout as well. Adjusting the limb weight also changes the rate at which the arrow flies from the recurve bow, making it easier to hit your target while in use. Right-handed and ambidextrous individuals can use this recurve bow. If you’re left-handed and you use this bow, you could end up hurting yourself. That’s why it’s important to understand that you need to choose a bow that has the correct orientation. The D&Q Recurve Bow is both easy to assemble and upgrade. Many other bows are complicated to put together and require previous knowledge. This bow allows you to assemble it quickly, even without a guide, and once put together, it will stay solid and sturdy. When you want to collapse the bow, you can do so, and at this point, it can fit into your bag easily. You can also choose to preinstall bushings or decide to install or upgrade to another type of arrow. Upgrades available are a plunger, a stabilizer, fishing reels, a quiver, a balanced rod, and a bow sight. This recurve bow comes with all the essentials you would need for a complete archery experience. You will receive one recurve bow with an arrow tube and an arrow rest. In the kit, there is also one bow stringer tool to help you assemble and disassemble the recurve bow as well as a bow sight, finger guard and arm guard for protection. You will also get six hunting broadhead arrows that are crafted from steel and have a cut diameter of around 0.51 inches. The length is 2.5 inches, and the blade width is 0.6 inches. Additionally, you will get six pure carbon arrows which are 31 inches in length and 7.6 cm in diameter. They have a spine rating of 400, a feather that is made of plastic and a vane length of two inches. You will also receive six replaceable field point arrows which are crafted from fiberglass. The length of these arrows is 31 inches while the diameter is around 0.3 inches. They have a spine rating of 550 and has a feather that has a length is three inches. There are multiple types of recurve bows available on the market. 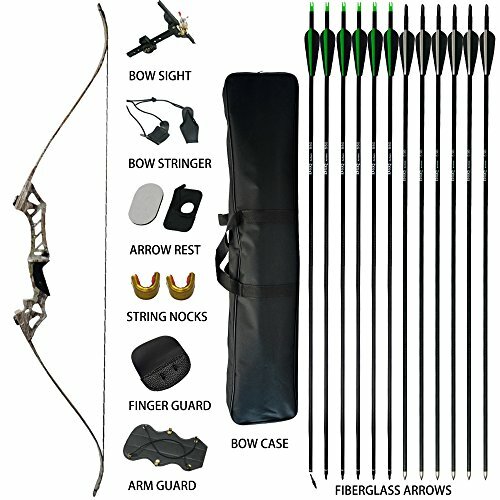 If you’re not interested in this kit and are looking for another that has similar features we can also recommend the Spyder XL Takedown Recurve Bow. This bow is available in right and left-hand orientations. It has a draw strength that ranges from 30 to 55 pounds and also features preinstalled threaded bushings which can be upgraded. The kit includes one handmade riser, matching limbs, a 14-inch Dacron string, and an adhesive arrow rest. This kit also comes with step-by-step instructions to help you put it together. Choosing the correct recurve bow can seem intimidating especially if you’re not buying it from a professional seller. This is why it’s important to make sure you know exactly what type of bow you’re looking for before you go out and purchase one. The D&Q Recurve Bow is perfect for beginners or intermediate-level archers and can be used for light hunting or recreational sports. It can be upgraded at any time, making it useful for various activities. This bow is also built with long-lasting materials and provides you with a sturdy base for accurate and wobble-free shooting. It’s easy to assemble and put together, and you can shoot longer distances without feeling tired or fatigued. Just remember that this bow is only designed for right-handed individuals. If you're not interested in any of the bows we reviewed here, why don't check out our detailed list of the 5 best recurve bows available today!